I don’t make it to Great Sage often (in fact, this is only my second or third visit), but on the rare occasion I am in the area (my family lives in the same state), I try to stop in for a bite. The menu fluctuates, which is a plus at any restaurant so far as I’m concerned, and it seems to always do a decent business. The agreeable ambiance of the restaurant combined with its friendly employees set a great first impression. The food isn’t five star by any means, but it’s highly enjoyable and, were it closer to where my family lives, I would routinely dine at Great Sage when I am in the states. The dishes are a good balance of healthy and comforting; you’ll find mock meats and cheeses, but only sometimes are they the centerpiece of a dish. In other words, the dishes don’t rely on pre packaged products to make them work. Great Sage has rotating daily specials, including two fresh, organic soups. 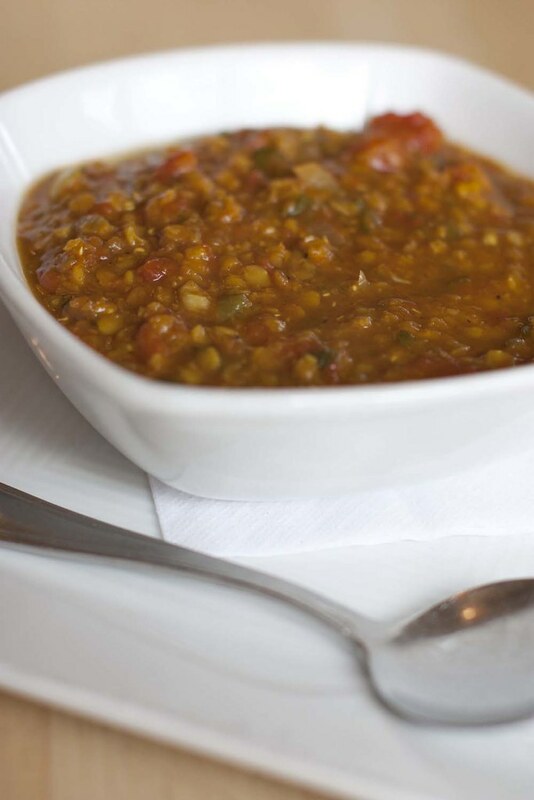 Mom ordered the dhal, a mild and aromatic lentil dish with a fusion of Indian and Western influence. Of all of the savoury dishes ordered, this cinnamon rich soup was her favourite. 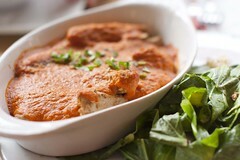 Roasted Beyond Meat ‘chicken’ in a creamy tomato sauce, served with brown rice and curried seasonal vegetables. I was excited to finally try Beyond Meat, a relatively new soya based meat substitute out on the American market. It was good, but I wouldn’t say it’s my favourite faux chicken. It is, however, meant to mimic chicken better than its alternatives, a claim I could not measure as I don’t remember what chicken is like. The tikka masala came in a very generous portion that was too large for one person to finish. There’s really no such thing as a typical chicken tikka masala, as everyone has their own prize recipe, so I will not judge the dish in comparison with how I would make this in my own kitchen. Instead I will just say this: It was a light and creamy dish, served alongside lightly flavoured greens and grains, that made for a nice lunch on a sunny May afternoon. This would be a great menu choice for anyone who is wary of strongly spiced Indian food. I am not physically capable of ordering anything but a reuben if it’s on the menu. Tragically, this stellar sandwich never made its way to Britain, not really, but rest assured it is one of the greatest food inventions of all time. 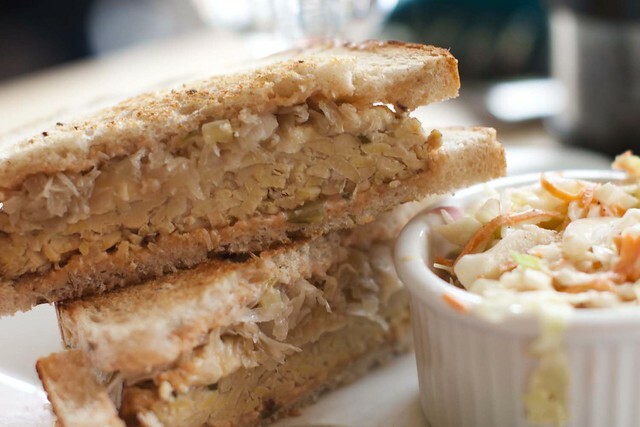 I have yet to meet a reuben I didn’t like, no matter the variation, and the same applies to Great Sage’s tempeh based sandwich. Plus the coleslaw that comes with is out of this world! Absolutely stuffed from lunch, we did what any sane person would do: order cake. 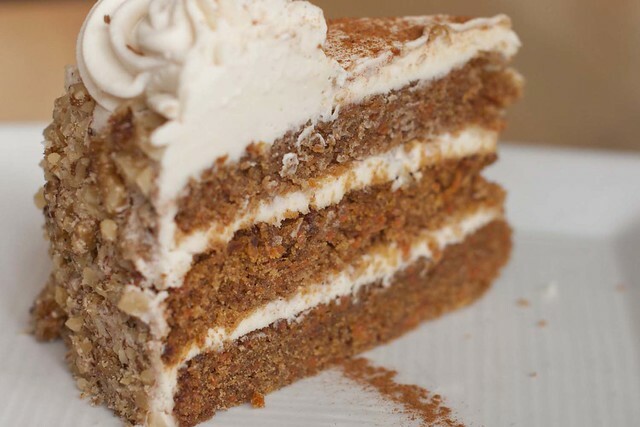 That was not a mistake, because Great Sage’s carrot cake is worthy of its fame. The icing alone would have been worth the cost of the slice! Maryland is home to a few wholly vegan businesses, but they are far and few between, so Great Sage is a nice treat from time to time. The restaurant is situated in a mini strip mall, with a few other independently owned business that are built on ethical standards, collectively known as Conscious Corner. Along with Roots Market, one of the best organic shops I have yet to visit, there’s Bark (pet supplies), Nest (clothing and gifts), and Boulder (men’s wear). I wouldn’t go to the ends of the earth to get there, but it’s well worth a look if you’re in the area.